AED's line of Kwik Kleen Kerrisons®’ patented design enables them to be fully cleaned, thus eliminating the build-up of bone, tissue, and bio-burden that can cause sticking and non-performance. Our wide grip handles provide complete comfort and control while the single lever feature makes opening and closing the kerrison easy. 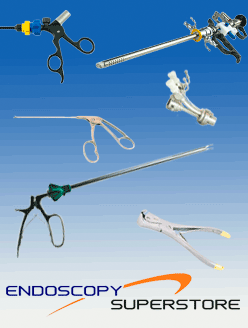 AED’s Spine Pro Bayonet Kerrisons offers you precise visibility of the surgical site. It has a universal handle design and can be easily used through a cannula. All Kwik Kleen Kerrisons® that Endoscopy Superstore® carries are modular which makes sterilizing them an easier task.